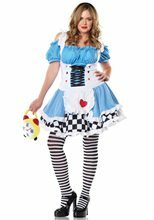 Malice In Wonderland Adult Costume.Includes: Princess Satin Corset Style Dress with Attached Apron, Crinoline and Leggings.Available Size: Womens - Small (6-8), Womens - Medium (8-10), Womens - Large (10-12). *Tea Cup, Wig with Bow, Choker and Shoes Not Included.Material:100% Polyester.Care Instruction: Machine Wash, Cold Water, Delicate Cycle, Tumble Dry Low, Use Cool Iron, No Bleach.This version of Alice had rabbit stew for dinner. Costume comes complete with corset style dress with attached white apron, crinoline and checkered leggings. 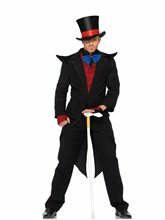 You'll spook everyone this Halloween in this gothic Malice costume! 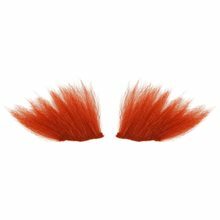 Mad Hatter Hat with Hair.Includes: One mad hatter hat with attached orange hair.Size: Fits adults 59-60 cm heads (23.5 inches).Material: Fabric lining. 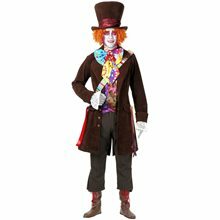 Taffeta, deluxe wig.This deluxe mad hatter hat is expertly constructed with the finest taffeta fabric and is imprinted with lovely details appropriate to only the maddest of hatters. Features a faux peacock feather and the iconic 10/6 badge is attached to the band. The band also features authentic gold tassel trimmings. Deluxe wig is attached to the hat. 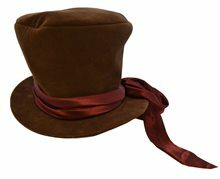 Hat is officially licensed by Disney for the Alice in Wonderland Line.